A couple of moms have been asking me about how I rearranged our home so that we can transform a part of it into a “montessori classroom/prepared environment”. I apologize for the delay. I have been meaning to write something but I’ve been quite busy juggling life with an active toddler and being pregnant. But I have decided to finally set aside this time to write some tips down that may help answer some of your questions. 🙂 Before I begin I would like to explain what a prepared environment is and its components. You can use this as a guideline as you think about the space you plan to prepare for your child. A prepared environment is a place designed to facilitate a maximum learning experience for a child that fosters independence and exploration. It is a well-thought of space that provides the child the freedom to discover and learn within limits. Structure is created through the arrangement of the classroom, well- chosen materials, order in the room and the location of the room you are preparing to make “your classroom”. A key question I had to ask myself was “where do I put our classroom?” There is a basement in our house and when we bought it, we initially thought it would the perfect place for us to set up our classroom. But after talking and thinking through it, my husband and I realized that though there was a lot of space and it was set apart from the rest of the house (which made it a distraction free zone), it had no access to natural light. What seemed to be the perfect spot, turned out to be not so great after all. I looked through the house and realized that the best place for our classroom, was our dining room. I consulted with my husband and I explained to him why it was the “best” location for our mini-homeschool. We had to talk about it since I was taking away our dining room! I chose to convert this area because it is the only place in our house that had giant windows, this allowed sunlight to shine in throughout the day (which saves electricity too) and it was spacious enough to set up our little work shelves. It had a little door in the back for me to access the room through the kitchen or at least peek through so I could occasionally check on my son during his work time while I was busy cooking or cleaning. The room was far enough that he wouldn’t get distracted if I was busy doing something else like cleaning the living room or doing the dishes in kitchen but close enough that I could get to him quickly if need be. So far it has worked out very nicely for us. Granted our dining table has been moved behind our living room, it is now a lot closer to the kitchen which makes cleaning up a lot easier! (haha) How about you? Are you thinking of your best spot? Here are some characteristics of a prepared environment for your home. You can use these tips for your child’s classroom or bedroom. 1. 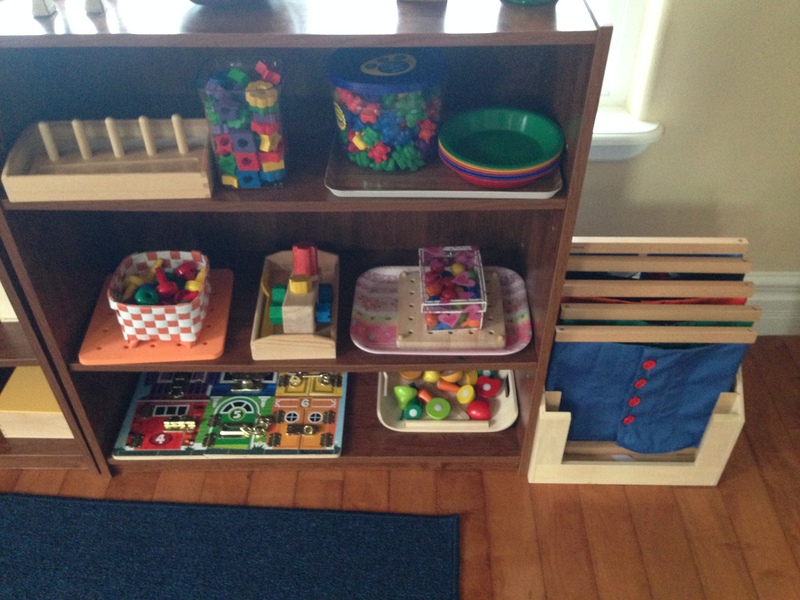 LOW OPEN shelves: These are designed so your child has access to them without needing your help! 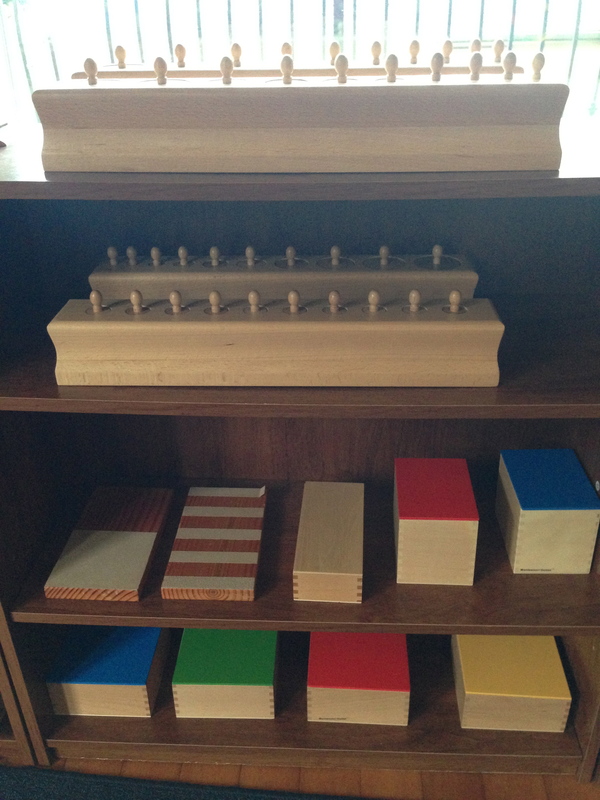 Remember, a key principle in montessori is INDEPENDENCE! You want to make sure you foster that in everything you do.We got our shelves from Wal-mart. They were $17 and I just put them together myself. 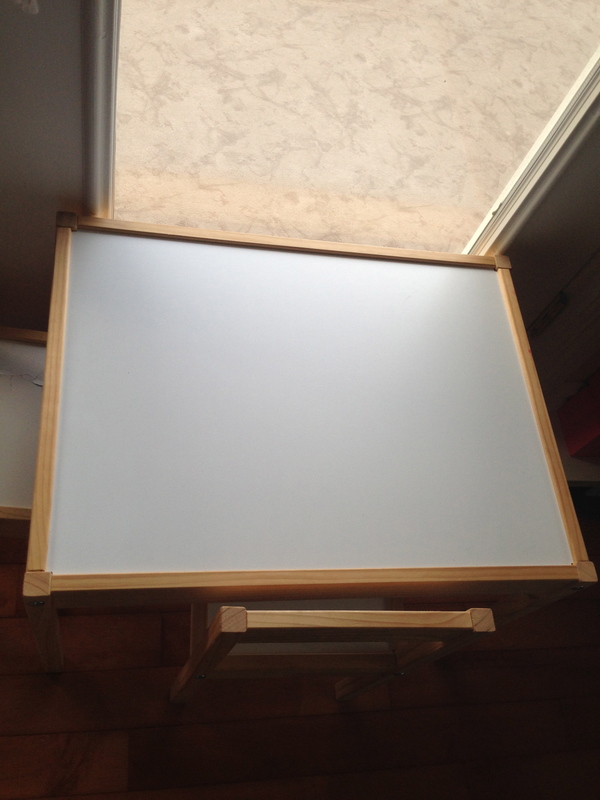 This table is positioned by the window so my son can look outside, make observations about nature during work time. Our second table is positioned against the wall. This allows for concentration and focus. 3. 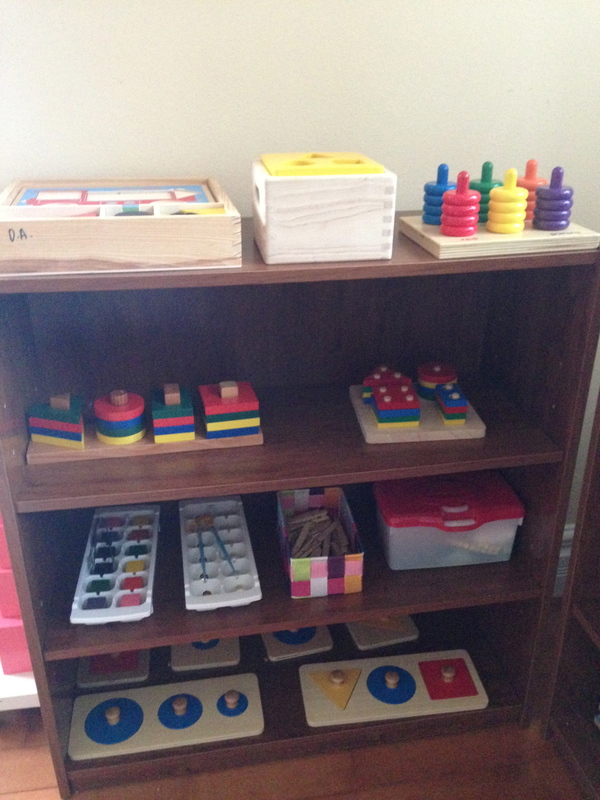 Group your materials according to the proper curriculum areas: practical life, sensorial, language, math and cultural: For now, I have a toddler shelf too. If you have shelves for more than one area, keep them right next to each other to show the progression. 4. Keep your classroom as attractive and as orderly as possible. : Avoid clutter! There is a place for everything and keep everything in its place. 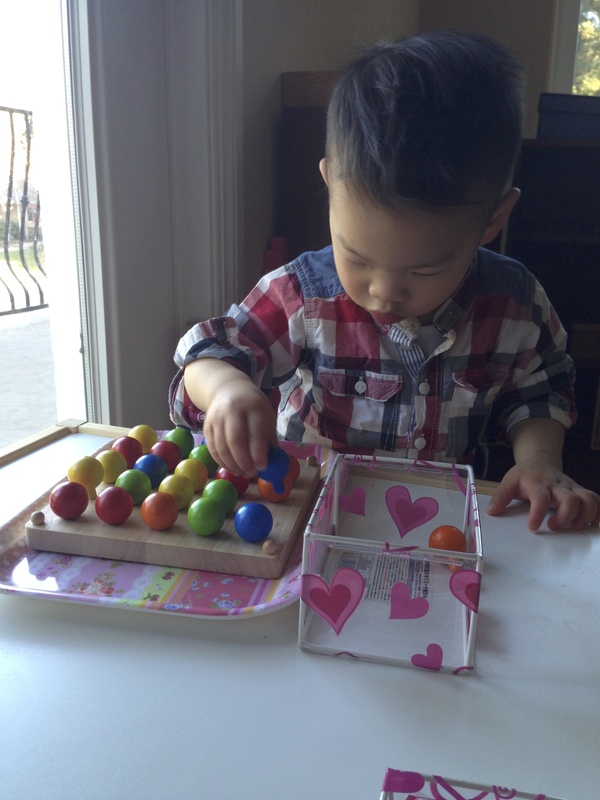 Use trays or baskets to hold specific activities. You can even color code the activities so the child knows which “family” it belongs to. EX: Having an basket for his legos, a box for his wooden blocks or a tray with vegetables to cut allows him to select which one he wants to work with first. This also makes cleaning up a lot easier and faster! 5. Divide the materials (such as puzzles, animals, etc) into sets, bringing out only a few at a time and rotating them periodically. This is our cultural top shelf. These are items I have collected from different parts of the world. Some are gifts from dear friends, some I bought and I just rotate them depending on our topic. 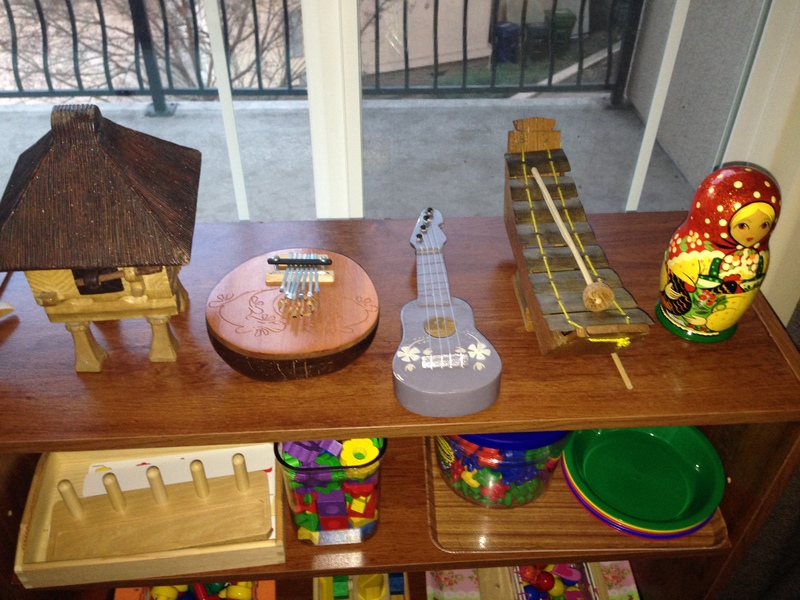 My son loves to play the different instruments from around the world. 6. Have a bookshelf and a nice comfy chair to have some quiet reading time. 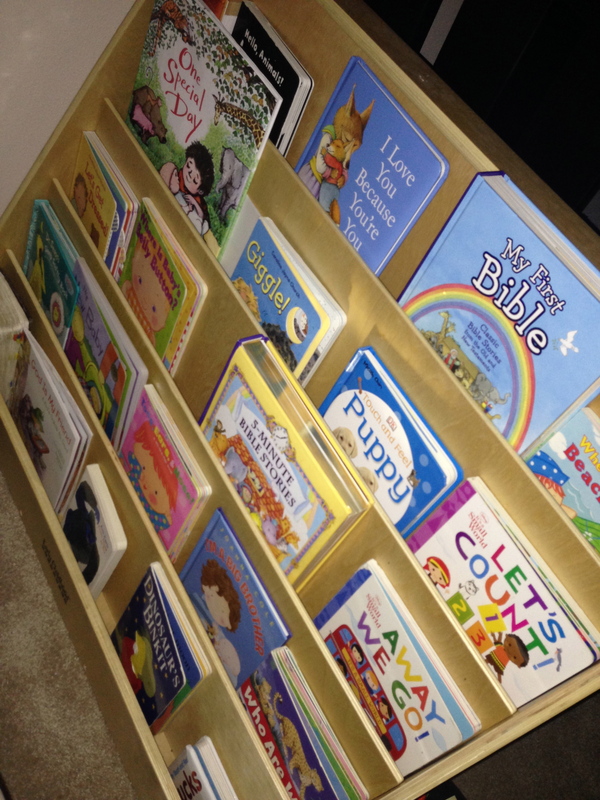 : Encourage your child to have independent reading time! 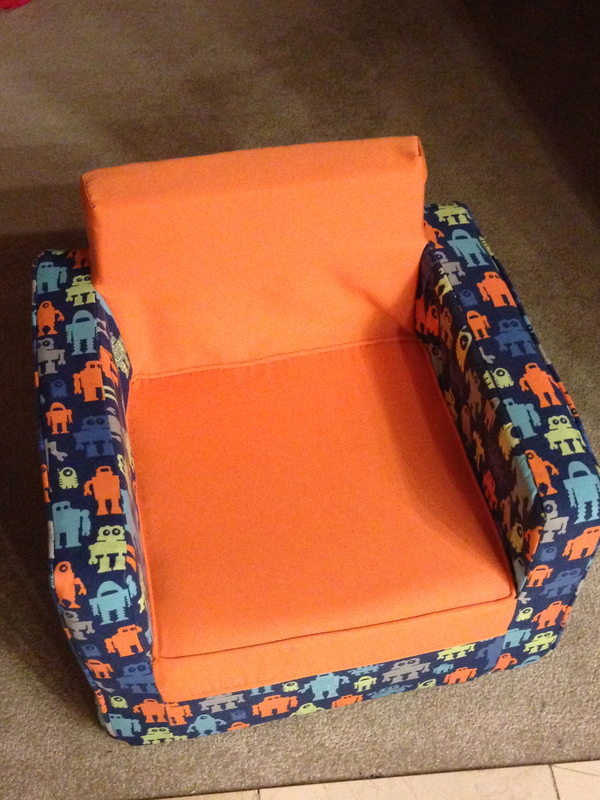 Allow your child to have a space in your house where he can sit back, relax and have some alone time. Don’t forget to ROTATE the books! Our current selections are books on being a big brother and having a new baby on the way since we have been talking to Micah about his baby brother that will be arriving any day now! 🙂 We are also learning about different animals, therefore books about them are on display as well! I personally prefer the one-sided bookshelves because it displays the books, allows for easy access, and it keeps the books nice and neat. This couch and bookshelf are in his bedroom. 7. 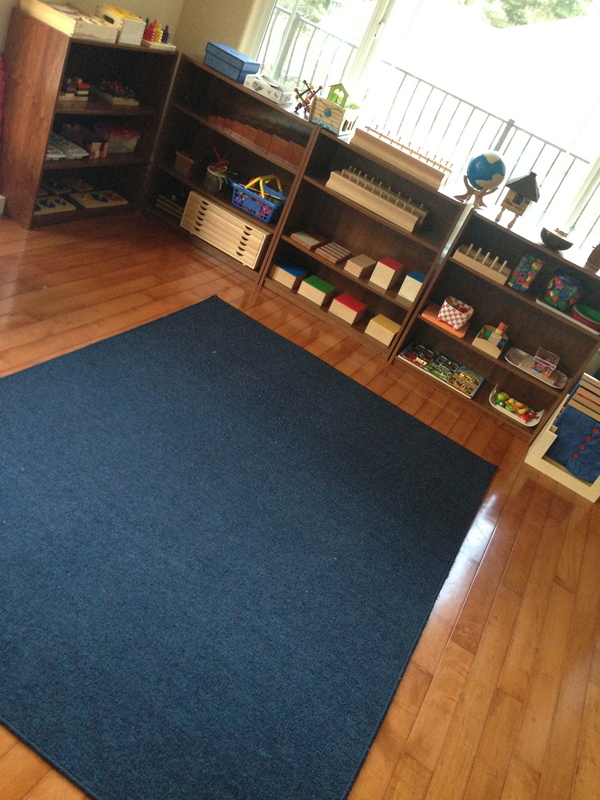 Use rugs or mats: This defines your child’s workspace and teaches them order. 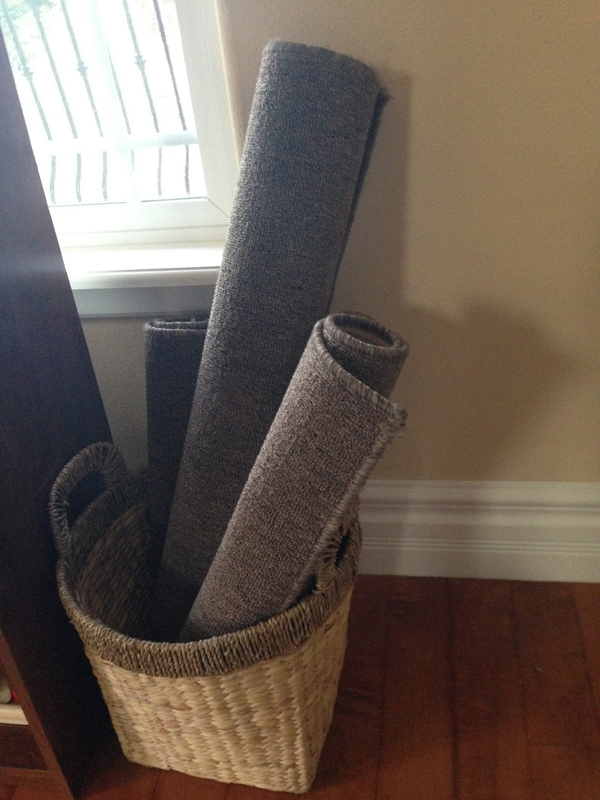 Have a designated place for your rugs so your child can roll it and return it after use as well. Rolling and unrolling a rug indirectly teaches your child coordination of movement, development of muscles and concentration! Believe me! It’s not as easy as it looks! 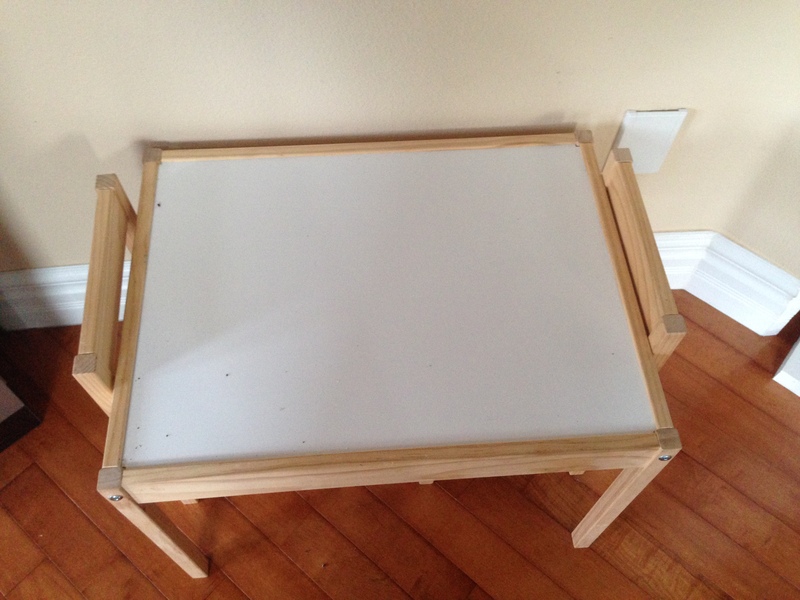 You can use mats for your work tables too, not just to protect them from accidental art work but it also teaches your child how to take control of his space on the table. I hope you find this post helpful as you create your own space at home! Feel free to share your ideas with me too! Awesome! Super filled with creative ideas and design! Can’t wait to follow! Wonderful article Diane; where did you get your one sided bookshelf? Awesome blog! What are the education materials & where dis you get them?? Looks wonderful, Diane. We’re moving into a new, bigger home in the Summer and will have a designated play area right next to the living room (with sliding doors). I am not a Montessori girl (and our little girls of 1 and 3 won’t go to a Montessori school), but I do like some of its principles. To what extent do you think it’s realistic to incorporate some of these ideas into our new play area, even if we don’t have a Montessori lifestyle in general? Thanks! Looks great and so neat and tidy and uncluttered! Great ideas for our play room. We have the low shelves and kid table/chairs. But I love the idea of the reading corner. Hi! I’m currently re-arranging our living room to adapt a Montessori playroom / classroom. What do you suggest I do with the old toys (plastic, battery operated, bulky)? Should I incorporate it in the new setup (I’ll put another cabinet just for these OTHER toys)? Or should I consider giving/selling them?